The other day we came across a very interesting analysis of Google's recently announced plans to create a contact lens that would be able to deliver minute by minute hands-off measurements of glucose levels in diabetes patients. A key thing to understand about the technology is that unlike with many other types of wearable tech, which can often be classified as solutions in search of a problem to solve (we sometimes think of Google Glass in this manner), a contact lens such as that Google has described not only has serious medical treatment possibilities but is in fact a true solution for a very real medical problem that affects hundreds of millions of people. The analysis we mention above considered the new contact lens from the perspective of how it would generate revenue for Google, as well as from the perspective of its benefits for Google investors. We aren't concerned here with whether or not the numbers within the analysis are accurate or not. Rather, we find it quite interesting to note a clear way by which wearable technology may very well end up delivering on a large piece of the revenue pie overall for the wearable tech market. As per the 2013 data from the International Diabetes Federation, there are 382 million people in the world that are afflicted with diabetes. This number is projected to grow to 592 million by 2035. The Google Smart Contact Lens therefore has a waiting market for it. The United States has 24.5 million diabetics, China 98.4 million, Brazil 24.4 million, Russia 10.92 million, and India has 65.08 million. Since it is a simple glucose monitoring eyewear, we can presume that the lens will retail far less than the $1,500 price tag of the Google Glass. I'm assuming that the Smart Contact Lens for diabetics will wholesale for around $100 each. The revenue from this price level will still be significant. Let's presume that Google will initially sell 20 million of the Smart Contact Lens on its first year of commercial release, that's already $2.0 billion of non-advertising related money. Essentially Alcarez is suggesting that one single product from Google can quickly generate up to $2 billion in revenue while barely tapping the total possible market. Well, that is the power of delivering solutions to very real problems. It also underscores our own belief - as we've noted many times - that medical and health-related wearable technology offers an excellent model for how wearable technology will find its way to becoming a $50 billion market by 2018-2020. We surely like the odds. Even so, we're also on record as suggesting the Google Glass is likely to become an expensive bookshelf ornament for many people who eventually buy it. Glass offers many possible solutions in search of real problems. By this we mean problems that do not already have solutions - whether simple or complex - already available. The Google Contact Lens offers a solution by way of greatly simplifying solutions that already exist and that are not necessarily much-loved. Who loves pricking their finger every day and carrying a glucose meter around? No one we know. This is the next major stage for wearable tech. It should come as no surprise - given that Larry Page has made it clear many times that Google is greatly interested in developing technology, including wearable technology, that will help us all live better lives, by which he means in some cases, technology having pure medical benefits - that Google has such a potentially very important project in the works to help diabetics patients. 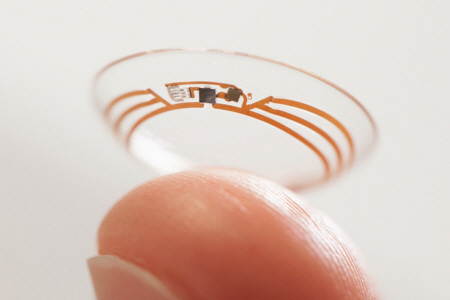 The contact lens comes out of Google X Lab, and is focused on developing a contact lens that will be able to test for distinct markers related to diabetes. The company noted this is a recent blog post, which included the image shown below. There is a great deal going on with smart contact lens technology. Another article we recently wrote provides a good deal of background on what is going on in this specialized area of contact lens wearable tech and is absolutely worth a follow-up read. The Google technology uses a wireless chip and a tiny glucose sensor that is in turn embedded between two layers of contact lens material. The resulting lens is - theoretically - able to measure the glucose levels in tears. The prototypes Google is currently testing are able to generate a reading once per second. This is rather powerful - glucose levels change all the time and in today's world it typically requires a pin prick, a means to dab the blood and then a means to evaluate glucose levels by way of a meter. Clearly such a contact lens would be a significant step forward. Assuming it works, the lens would greatly help diabetics regulate their blood sugar levels more effectively - and far more easily - and avoid having to test their blood with those finger pricks throughout the day. But as is to be expected, there is a great deal of work yet to do. The good news is that in December four Google executives met with the U.S. Food and Drug Administration (FDA), according to a schedule that was posted online. In the blog post Google acknowledges these discussions and makes it clear "there's still a lot more work to do to turn this technology into a system that people can use." One of the things that need to be overcome is in creating an efficient means for the lens to wirelessly communicate its findings back to a mobile app for the patient and/or to a cloud-based monitoring system that can also communicate with healthcare providers. Our earlier article details some of the ways this can be done. One method would be for the lens to use RF to communicate with a wearable tech device that would then use low energy Bluetooth to communicate with a mobile device such as a smartphone. The smartphone would run the app and would be able to use Wi-Fi to communicate up to the cloud. It is interesting to see how a larger overall value chain can be developed through such a personalized device as a smart contact lens. This value chain not only propagates the value of wearable technology itself, but eventually every point along the value chain stands to find a means to delivering new revenue to the companies providing the value points in the chain. We believe that the revenue generating "halo effect" of wearable technology will in fact far exceed the revenue of pure wearable tech over time. The full article by Alcarez providing the detailed analysis for Google revenue from wearable technology is available at Seeking Alpha.